Being a backend developer my focus is usually on server side issues – languages, databases etc. However, as a web developer in general, a good knowledge of frontend design is also necessary as this enables one to work more effectively with the design and frontend development team. As for myself being a single freelance developer, I also need to be comfortable with frontend issues to work effectively with clients. Lately I have been focusing a disproportionate amount of time on server side programming and Internet of things, that I have somewhat lost touch with the changing landscape of frontend development. I needed to quickly update myself with the latest happenings in that area. Luckily I found a book that quickly covers the latest design and development trend in frontend design. ‘Frontend Architecture for Design Systems: A Modern Blueprint for Scalable and Sustainable Websites ‘ by Micah Godbolt is a short and to the point book that distills the latest frontend design knowledge so that you can quickly get updated on various issues in the field. Each part of the book covers various aspects of design and best practices for that category. For example the Process Pillar part discusses various issues like distribution, integration, task Runner etc in a brief manner. Of course the book does not go into details on each topic as that is not the aim of the book, but it will quickly give you insights and topic summaries after which you can decide in which topic you need to peruse for more elsewhere. The days of designing adhoc systems is gone. Now with large sites or even with smaller ones, we need best practices to lay a good foundation towards designing a scalable and sustainable design system. 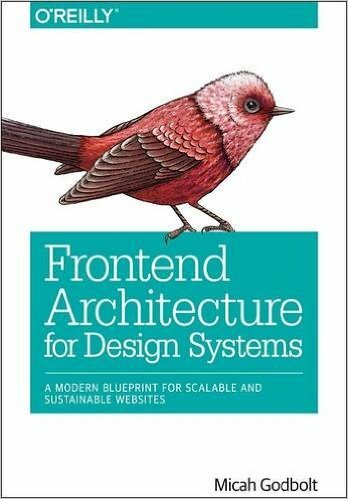 ‘Frontend Architecture for Design Systems: A Modern Blueprint for Scalable and Sustainable Websites ‘ will help you in that endeavour.